Are you still using WordPress administration area to write your blog posts? If so, it is time for a change. 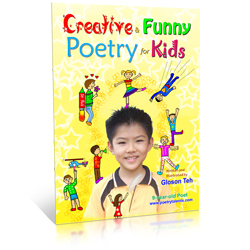 There is a writer which is much better than WordPress. That is, Windows Live Writer. To me, it is the best tool for writing blog posts. And here are the reasons. When you set up your blog in Windows Live Writer, it will detect the layout of your blog – the font, the colors, and the theme. After that, you can write in your blog layout. Isn’t that cool? If you changed the layout of your theme, click View >> Refresh theme to refresh the layout in Writer. If you do not, you won’t be able to write in your newest layout, but can still write & publish posts. 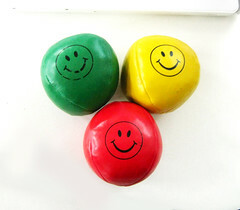 To insert the pictures into your post, click Insert >> Picture…. 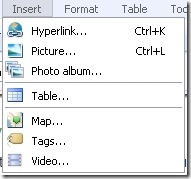 Then, you can insert the picture from file, or the web. After you have finished inserting, you can edit them and give them effects. Writer has many effects that can be done to your photo. 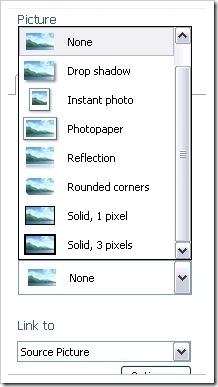 If you select a picture you have inserted, 3 tabs and its options will appear in the sidebar. In the ‘Picture’ tab, you can choose the text wrapping of the picture, its margins, its borders, and where it links to. In the borders drop-down list, you can choose kinds of borders for your picture, such as drop shadow, instant photo, photopaper, reflection, rounded corners, 1 or 3 pixels borders, no borders at all, or use the style of your layout. 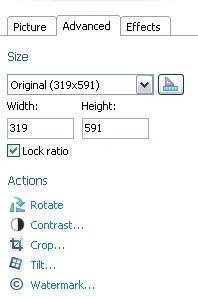 In the ‘Advanced’ tab, you can resize the image, rotate it, adjust its brightness and contrast, crop it, tilt it, and even give it a watermark. In the ‘Effects’ tab, you can give the picture kinds of cool features . Those include black and white, sepia tone, adjust temperature, color pop, sharpen, Gaussian blue, and emboss. 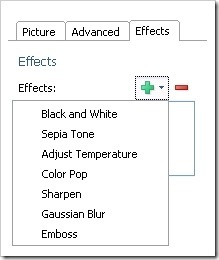 If you want to remove an effect simply click the red ‘minus’ button. After you have inserted the pictures in there, just click ‘Publish’ near the top left, and the publishing progress would appear. But it just takes a little more longer, though. But, you can also configure an FTP client to upload the pictures. 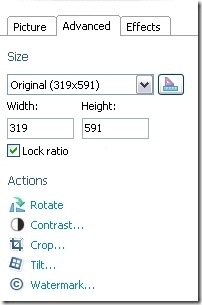 Click Blogs >> Edit blog settings >> Pictures and from there, you can configure the client. If you have two blogs or more, don’t worry. Writer lets you switch your blogs easily. To add a blog account into Writer, click Blogs >> Add blog account…. Then, you set up your other blog. To switch, click Blogs >> (The the title of your blog). You then can write on the blog you’ve selected. The layout would also change according to your blog. Writer also lets you edit the properties of the post, such as its categories, publish date, tags, slug, author, excerpt, password (if you want to keep it private), and trackbacks. To show all of the options, you have to click the ‘Show Properties’ button. After that, the properties will show. Writer lets you insert videos to the post via YouTube or SoapBox. Click Insert >> Video… and then, choose the service you want, and enter the details. After that, a window asking for your username and password will appear. And after you click that, the video would be inserted into the post, but in the process of being uploaded. If you have published a post via Writer, and you want to edit it again, Writer will retrieve it from your blog, in case you made changes to that post using another tool. This is so you can edit the latest version of the post. If Windows Live Writer is unable to retrieve it, it would open the draft saved on your computer instead. You can write posts offline. This is useful when my internet connection is experiencing problems. Also, you can change the color of the interface of Writer by clicking the brush icon, and then selecting the desired color. However, Writer only works if you enable XML-RPC. To do that, go to your WordPress Administration Area >> Settings >> Writing. Setting your blog up in Writer is just a piece of cake – First, you have to choose what blog service you use. Then, you have to enter the URL and your username and password. After that, Writer will do everything, including detecting your layout. 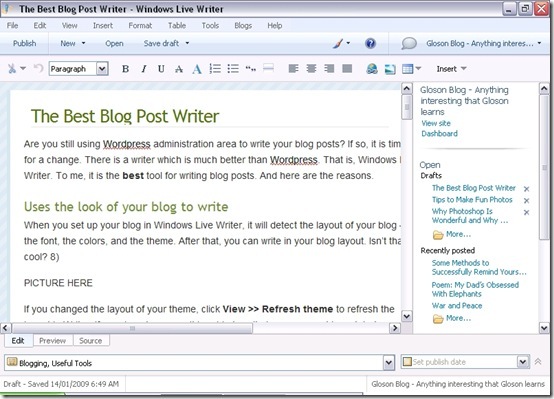 Windows Live Writer simply makes writing blog posts much easier. I love it, and you would love it too. It is like one of the blogging tools I can’t live without. Get it now! Pssst…It’s completely free.